Be amazed, be thrilled, learn something new — read chapter 4 of P4TP and pass on the link. It’s a great way to whet people’s appetite and make them hungry for more information on this new type of nuclear power — which can be found by reading the whole book, reading this site, and going over other warehouses of info like Steve Kirsch’s IFR website. I’m currently up to Part IV of my VI part review of P4TP on BraveNewClimate. I’ve still got important topics to cover, such as the proposed programme of international oversight of IFRs, and the story of what has stalled progress to date. In other news, BNC reader David Lockwood alerted me to an interesting new study by a group from MIT on global warming, to appear in Journal of Climate (published by the American Meteorological Society). There are a couple of news stories about it, here and here. The graphical ‘roulette wheel’ results of the study are shown below. Their probabilistic analysis implies that a ‘no mitigation policy’ scenario — right hand wheel — is likely to lead to warming of about 5.2 degrees Celsius by 2100, with a 90% probability range of 3.5 to 7.4 degrees. This estimate is somewhat higher than the range projected for the A1FI scenario from the latest IPPC report in 2007. The new work by MIT has included improved economic modelling based on updated emissions data, more explicit handling of aerosol masking and soot-driven warming, and improved measurements of deep ocean temperature rises — the latest data suggests lower than expected transfer of heat and CO2. There are lots more details to be found in the story written up for Science Daily. Substantial policy intervention (read ‘deep and sustained mitigation’) — left hand wheel — lowers the odds of severe warming, but it still leaves a substantial burden of adaptation for future generations. Still, if you were in the climate casino, which wheel would you rather spin? I’ve just come back from a technical and commercial conference in Aberdeen on clean energy. There were some sessions on nuclear power, mostly on UK policy and important things such as finding and training enough people to meet the demands of a possible resurgence. I couldn’t go to those sessions, interesting as they sounded so I’m not sure if things like Gen IV were mentioned etc. However, walking around the exhibition I fell into a few conversations about nuclear but no one seemed to know about IFR/Gen IV. This could be due to a number of things e.g. i the people I spoke to are flat out trying to make their part of renewables etc work and so don’t have time to look at other things and ii. I chose the wrong people to talk with on nuclear. Anyway, the poeple I spoke to were interested and so I spruiked this website. A small action but perhaps Barry posting Tom Blee’s chapter is good timing. anybody have details of the reactor plans he is backing? I have today posted a posted on Nuclear Green a discussion of the relative merits of the IFR verses the LFTR and its less well know MSR cousin, the Liquid Chloride Fast Breeder. I am sure that many of the readers of BNC, will object to my contentions, but I attempt to point to issues that will require far more research and discussions. [Reply also posted at Nuclear Green] Charles, an interesting analysis. The IFR concept includes metal fuels (a ternary alloy of U-Pu-Zr) which provide a -ve coefficient of reactivity. Of the other advantages you list for the LCFR, the IFR also provides sufficient cooling via natural circulation of the sodium, and of course the sodium will not boil (criticality will be lost well before such temperatures are reached). The IFR operates at near-atmospheric pressure. There are lingering concerns about the safety of sodium and the possible dangers of sodium leaks — something I will address in a post on my site in the coming week or two. It is an issue worth examining in more detail than I have room to do here, but sufficient to say this is a card far too overplayed. The LCFB is an interesting concept and I wish it had been developed more fully 30 years ago. But the fact is that most funds were directed to the LMFBRs and the result was ultimately the exemplar 10 year project at Argonne from 1984 to 1994 that developed the Integral Fast Reactor concept and mostly proved it up (the last step remaining is commercial scale pyroprocessing, which has seen ongoing development). I know it has left a bitter taste in your mouth to think of the unnecessary lost decades that followed the abandonment of serious LFTR research at ORNL. I, like you, wish it had been otherwise, and that we now had a commercialised LFTR and even LCFB. Realities will change in the coming decades, but for now, we have the S-PRISM, an IFR-based design, ready for build. It represents an excellent concept, as readers of Nuclear Green will appreciate if they take the time to read over my blog (http://bravenewclimate.com) and of course read Tom Blees book, Prescription for the Planet. Whether the LFTR or IFR (or LCFB) is the superior technology is largely an academic matter. The bottom line is that all are excellent designs and represent, to me and many others, the future of nuclear energy, the most realistic way to solve the climate and energy crises, and a source of great energy prosperity for many future generations. All should therefore be pursued vigorously, and I make it a point not to try to convince anyone that one design trumps another. We cannot really know that until large-scale build-out is well underway. My hunch is that both will play significant roles. If we are stuck with the situation where one must choose either the IFR or the LFTR when scrapping for funds, then I think we, as a community of nuclear environmentalists, have a problem. That will mean that insufficient attention is being directed towards nuclear power, and that the possibility of a worldwide supply of carbon-free energy generation has been squandered. At that point, climate will damn all losers. I think the argument that we have to pursue one or the other (LFTR or IFR) is even less valid than the solar/wind advocates’ similar and frequently-voiced false dichotomy that says we can’t afford to spend money on nuclear because it’ll take away from solar and wind. The amount of money we’re talking about to build one single IFR and the amount it would take to jump-start LFTR research to build one LFTR is small change compared to virtually any potentially transformative energy-related project. When I first discovered LFTR and began corresponding with Kirk Sorenson (the prime mover of LFTRs) about it, there was a lot of anti-IFR sentiment among LFTR proponents. Kirk and I met since and I have done what I could to bring the LFTR to the attention of people like Jim Hansen and others who could give it some public exposure. I felt (and still do) that IFR and LFTR proponents should work together and that the two technologies pursued simultaneously will allow us to eliminate fossil fuels faster than either by itself. Kirk has been quite amenable to this idea, as have many of the LFTR crowd, for which I am very grateful. I’m hoping we can get past the “herding cats” phenomenon with proponents of various nuclear technologies continually running down the others. In my opinion, metal fuel, pyroprocessing and fast reactors are eminently more sensible than LWRs and oxide fuel, but their deployment in Gen III designs shouldn’t scare anybody. Since we know we’ll be able to use up their spent fuel in IFRs and that they are certainly going to be built for some time and will help put coal out of business, I welcome what they can contribute. If there’s a dichotomy here that we should be paying attention to it’s “fossil fuels or nuclear.” Pick a side. Let’s not bicker about the details. The fact is that any type of nuclear reactor built from here on out is going to be far safer than any of those currently in use. I would still mention my leeriness about the Pebble Bed reactor if only because of the difficulty of recycling its used fuel. I think that’s a fatal flaw of that system if we’re trying to eliminate long-lived nuclear waste. That being said, even that waste could easily find a long-term home in places like WIPP, but why go down that road at all when we have so many better options? IFRs and LFTRs can ultimately use up all the energy in uranium and plutonium and thorium fuel. Why throw it away in used pebbles? Berry, One of my complaints about renewable supporters is that they ignore potential debates among themselves. I think it is better for us to lay the cards out on the table, and let the public know that there may be choices to make. Part of the bitterness at ORNL stemmed from the fact that hundreds of millions of dollars that could have been spent or MSR development, was spent instead on the poorly designed Clinch River Breeder Reactor that was built in Oar Ridge, but was not an Oak Ridge project. There was also the feeling that Argonne and INL stabbed ORNL in the back as part of the IFR deal. I am concerned that IFR advocates confuse inherent safety features, such as a negative coefficient of reactivity with inherent safety. LFTR advocates have no reason to assume that the LFTR is more likely to leak than IFR users do, yet we tend to discuss the barriers to FP escape in the event of leaks, while IFRs tend to think tell us that we need not be concerned about IFR leaks. Beyond that IFR need to think about what are the problems of the IFR and how they might be solved. This is very much the focus of Energy from Thorium discussions. IFR advocates need to try to assess IFR costs, and focus discussion on how IFR costs might be lowered. If the IFR costs $3.00 per watt, and the LFTR costs $1.50 per watt, the IFR will be an also ran. So far IFR advocates have not offered us any reason to think that the IFR will be cost competative with the LFTR. As Barry knows, personally, I believe there is no reason for IFR and LFTR advocates not to work together when the need arises, especially around general discussion of Generation IV reactors and their future. I really don’t see a “we’re funding this reactor so we don’t need to fund that reactor”. Heaven forbid we ever get into any acceptance that there is a limited pool of money for R&D/Deployment. It’s the same fight, really, against the…forces of darkness and, to a more immediate sense, the “uranium-industrial complex” that isn’t interested in investing in technologies 10 to 20 years out. Charles makes a good point that IFR needs the kind of semi-public discussion forum as represented by energyfromthorium.com. It is one of the best examples of a “technology clearinghouse” I’ve ever come across. LFTR advocates have simply “pointed” people toward energyfromthorium.com and energyfromthorium.com/forum and we make ‘convert’s rather quickly. I’d like to see something like this for the IFR as well. Tom, it all boils down to a choice between whose views do I accept. On one hand I have your views, and on the other I have the views of Eugene Wigner, Alvin Weinberg and my father. I would need a much more convincing argument from IFR advocates before I would change my mind. So far LFTR advocates have made hundreds of primary technical documents available on the internet, while IFRs have offered us only second hand assessments of the IFR. While LFTR advocates openly discuss LFTR liabilities and how best to overcome them, IFR advocates deny that there are any problems to address. LFTR advocates engage in open and public disagreements about design options, while IFR advocates tell us that it is impossible that there be any flaws in existing IFR design or problems to solve. People who lack my perspective might be impressed. I am simply not convinced or even impressed by the case IFR advocates have made so far. Charles, there was virtually no discussion at all about LFTRs since the Fifties. IFRs, on the other hand, proceeded with their development and carried it to the point of commercialization, where it’s now stuck. Much of the sort of discussion among LFTR advocates is the sort of discussion that was not only carried on by IFR researchers but which was tested at length and resolved. I’m sorry I haven’t been able to find the time to create a discussion site for IFRs like Kirk developed with you and others for LFTRs. That would certainly be good for public education. I can tell you that much of the sort of discussion and openness about potential problems with IFRs has been going on, and continues every day, albeit not on a blog site. Barry and others have long been involved in such discussions with several of the developers of the IFR, which is perhaps why we’re more enthusiastic about it than you. I’ve been researching it for a decade, having started with no preconceptions whatsoever about nuclear power of any kind. As far as I can tell, nobody’s trying to sweep potential IFR problems under the rug. We’re just trying to get one built. I just went back and read your page you cited above. I have no reason to doubt that if LFTRs and their related designs had been pursued we’d likely be seeing them running today, and I do believe we should pursue the research. But since the IFR is actually ready to be built and since the climate change crisis is at the door, if the IFR is safe to build we should build it and pursue LFTR research too. 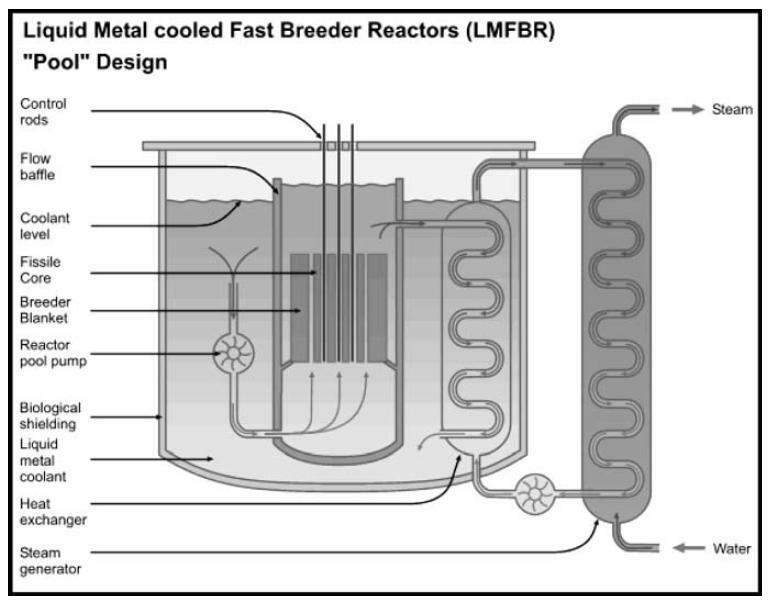 IFR concepts during the 1990’s included the notion of factory constructed modular reactors. But no assessment has been yet offered on possible interaction between IFR size and safety. Safety is a far more critical issue for the IFR than for a MSR for obvious reasons. The NRC has not yet developed safety concepts for either the LFTR or the IFR, but given the implications of major safety problems such as a coolant leak or a core rupture, IFR safety requirements are likely to be far more stringent, and costly to meet. I’ve gotten risk assessment studies for the PRISM reactor and provided them to Kirk Sorenson, the same ones that the NRC has already seen. There has indeed been an assessment of safety vs size in IFRs, which has guided the PRISM development to determine a 300-360 MWe size for reactor modules. The costs for this have been taken into consideration, with an estimated power cost for IFR-produced electricity coming in at about 4.6¢/kWh. I agree with Barry that the hazards of sodium have been far overblown. It’s a relatively simple engineering problem, one that’s being dealt with in half a dozen countries that are building or planning to build sodium-cooled fast reactors. I also believe the cost and complexity issues are usually baseless. Certainly we could afford to build one to discover what the results are in this regard. If we develop both and the LFTR ends up proving to be a superior design, so be it. But forsaking one in favor of the other is a needless restriction on our ability to bring to a close the era of fossil fuels. Charles Barton – As you probably are aware I am fairly anti-nuclear. However my main objection to nuclear is proliferation and waste. If we go down a crash program of nuclear we run the risk of ending up with thousands of PWRs using a once through cycle. It is a bit like the Tar Sands or corn ethanol for oil. Nobody likes the ‘solution’ as both are environmental disasters however they get funding because they are relatively easy to implement and they appeal to lobby groups anxious for subsidies. PWRs appeal in the same way. Various nuclear lobby groups eager to make a profit could easily hijack the favoured GEN IV nuclear path of recycled nuclear material for the easier conventional PWR path to coal displacement. You and Tom Blee’s appeals to reason could easily fall on deaf ears as the PWRs are deployed in the name of saving the climate. I am perfectly happy with IFRs and LFTRs playing a role in the future energy mix. Both have merits and disadvantages however as you know I prefer the LFTR as it integrates with renewables far better than the IFR. Also taking uranium out of the fuel mix, except for eating present waste, makes then far safer. I would most like to avoid a mass program of PWR building. My favoured renewable first path starts with energy efficiency and conservation. Then comes the displacement of coal with renewables. Also we need to electrify transport and change peaking generators to renewably produced fuel sources. All of this can occur while GEN IV research continues. Then when GEN IV is ready to go it can fit into the mix where renewables just do not work. Australia is one of the countries in the world where we can shoot for 100% renewable and maybe achieve 90% by 2030. However I realise that other countries not so blessed with low population and massive renewable resources will need something else and this is where GEN IV nuclear will play a role. The thing that I do not support is a rushed, crash program of conventional PWR in the name of being green. PWRs WILL take resources from renewables in the competition for grants and investment money especially if lobby groups get into the act. Then if GEN IV ends up being a dead duck we will have millions of tons of high level waste to dispose of with no easy way to recycle it. Ecology groups? Forgive me, but I don’t consider Greenpeace and FoE to be ‘ecology groups’. The debate about IFR/LFTR reminds me of the few debates we used to hear about CSP versus PV solar energy. When a relatively few designs are being built and the time and cost to build them is substantial this is the result. You may notice not a lot of debate about the merits and advantages of direct drive, variable pitch, variable speed, on-shore versus off-shore wind turbines. The market is sorting out advantages and disadvantages and new innovations are being incorporated in the short build time faster than most people are aware of the issues. The issues are expanding grid connections, capacity constraints, trained staff for instillation and maintenance, issues that are difficult for one company to solve quickly. This is the difference between building a product in a few months with a few million unit cost versus building over 5 or more years a nuclear reactor with a few billion unit cost. What the nuclear industry needs is higher volumes(hundreds/year) and faster construction times(less than one year) that can plug into a range of standard steam or gas turbines. The reactor designs that seem best able to do this will be small such as the lead/bismuth design or the LFR, making it possible to mass produce in a factory setting. Neither seem to require massive containment structures necessary for early generation reactors and seem to be required for sodium cooled reactors. Leaks or failures are going to occur, so you need a way of “unplugging” and replacing a defective unit without long delays that occur in repairing in situ. In some ways modern aircraft are similar to nuclear in being high unit investments need for high safety, evolving designs but long model life. Everything else is different. Barry, you mention the ternary fuel rod alloy. Whats the makeup of this? Whats the coefficient of thermal expansion? Whats density allows sustained reaction and at what temperature/density does the reaction shut down? “The IFR operates at near atmospheric pressure.” How near? Is the qualification due just to the hydrostatic pressure at the core depth in the sodium pool? Tom often refers to the S-PRISM design. Are there design documents available for this plant? Drawings? How does refueling work? Can the plant produce power during refueling? Pyroprocessing is similarly opaque. What are the details of this operation? Is the separation based on different redox potentials of the elements? Or perhaps solubility in the molten salt electrolyte. How selective is the separation for actinides vs lower atomic number species? What are the issues with PBR fuels? Are these sorts of questions commercial secrets? Are details of power plant designs classified materials? I’m approaching this as a scientist from a different field, so I tend to have an awkward mix of basic and detailed questions. I’ve read a lot of the general material and am now looking for more technical information. GE documentation of the S-PRISM would be great if its available. Neil, I’ll need to do that post about small reactors. You’re wrong about scalability of the SFR (sodium-cooled fast reactor). They’re just as flexible as a LFR (lead-cooled fast reactor) — or are you referring here to the LFTR (liquid fluoride thorium reactor). The IFR is based on 380MW reactor units, which can be grouped in paired blocks and then multiple blocks used to build-up large plants (e.g. 2.5 GW) as desired. Or you can have a single 380 MW unit. Or you can go for something like the Toshiba 4S nuclear battery, which is also a SFR that is very similar in principle to the IFR unit — processing of spent fuel would obviously be at an off-site facility in these cases. Hi John — quite a bit of technical documentation has been referred to in various comments already. It’ll take me some time to muster up, but there is a lot around that will answer most of your questions, including about S-PRISM and pyro. John, as you correctly note I wrote my book for the general public. On my web site I do have links that’ll direct you to the documents in most of the footnotes. As Barry can attest, much information has flowed directly from the scientists who developed the IFR and so I don’t have official reports on some of the questions you raise. I’ve also gotten some technical reports in hard copy that I necessarily can’t link to. I would suggest that if you really want to get these type of technical questions answered you might just contact GE-Hitachi Nuclear and ask them what you want to know. I would suggest being concise and brief, because if you scattergun them like you do in this post I frankly doubt that anybody there will take the time to respond, since there doesn’t seem to be much direction to your queries. LFTR advocats fasvor virtually identical deployment approaches, with modular unit sizes falling somewhere from 100 GWe to 500 GWe in generating capacity. In the case of the LFTR sub moduels would be transportable to set up sites, and quickly assembled. Tom, I have posted a responce on Nuclear Green. My mistake, I thought a large containment (concrete vessel) outside the steel reactor vessel was required in case of a sodium leak. A fact I don’ t really understand about IFR vs MSRs is how much “clean” in transuranics the waste stream is it, i.e. how much of the TRU recycled in the reactor is realistically “burned” ? I guess it should be a very number in %, even only 99% let too TRU not burned in the waste, so the final radiotoxicity is not lowered of a great extent… Have you got any figures ? posted 26 May 2009 at 7:13 PM by Alex P.
I was thinking on the lines of the SVBR-100 that can be transported on a railway flat car, but has temperatures high enough for gas turbine cycles. I thought two of the advantages of the Li/F molten salt reactors was that they can also be small and operate at high temperatures, and less corrosive than lead. Thanks for the suggestion Tom. I’ll save that as a last resort. There’s no direction to those questions since their just gaps in my understanding I’d like to fill. Since I’m really asking for a graduate course in nuclear engineering, I think I’d better work through the MIT Nuclear Engineering course materials before I bug GE. I might also reference an American Scientist article by Eric Loewen, who’s at GE, on metal cooled reactors which looks like it answers some of my questions. Ender, I would not expect a huge program of LWRs in the immediate future with the possible exception of China. LFTRs, being well suited for part timde and part power generating tasks, could compliment renewable energy sources, but it is likely that were LFTRs assigned a role as back up generators for renewables they would begin to replace renewable sources entirely. I am not sure what role the IFR would be suited to play in a post carbon generation system. Below are various and sundry to more than get you started — some are non-peer reviewed articles for the lay audience or technically savvy, and a bunch are peer reviewed journal and conference papers. W. H. Hannum. Progress in Nuclear Energy, Special Issue, Vol. 31, Nos. 1–2; 1997. Y. I. Chang and C. E. Till, “Design and Performance Characteristics of Alternative Fuels and Fuel Cycles,” ANL-80-40 (1980). It is burned in multiple passes — pyroprocess, burn/breed, pyroprocess + add more DU, burn/breed, pyroprocess + add more DU, etc. Eventually >99% of the Pu and minor actinides that have been bred, are consumed. The final radiotoxicity of the waste stream is almost completely due to the fission products. See above post re: John Morgan for some technical refs. posted 27 May 2009 at 12:42 AM by Barry Brook in reply to Alex P.
All reactors — IFRs, LFTRs etc. would require a containment structure for prudence’s sake — ideally, we should bury them too. Have a read of Blees’ later chapters for some good discussion on this. The nuclear batteries would also be buried. Thank you Barry, this is helpful. Wow, Barry, thats fantastic. Exactly what I wanted. Thank you. I asked Yoon Chang about this one time (he’s widely considered the leading expert on this technology), and he explained the details of the pyroprocessing. Essentially you can adjust it and run the material through in multiple passes to get essentially all of the transuranics out. “You can set up a target of 0.1% loss or any appropriate limit and the process can be designed to achieve it.” Bear in mind that the lion’s share of that 0.1% would probably be U238 anyway, which is relatively harmless (assuming you’re not inhaling it). So you’re pretty much using all the actinides. Something to bear in mind: There are some very good places to dispose of what waste there is left that we have every reason to believe will be stable for millions of years. I suggest reading Gwyneth Craven’s chapter 16 on the Seabed Working Group in her book Power to Save the World, and her chapter on WIPP is also quite good in this regard, since her nuclear guru was instrumental in both these studies (I think he directed both of them, in fact). Someone else has recently written a book with a lot of info on WIPP, though the title escapes me at the moment. The amount of space to safely store this and other waste that can’t be burned in IFRs far exceeds the space that will be needed. It requires an objective view of the science and not knee-jerk reaction, though. Needless to say, the very mention of putting any of this on the ocean floor freaks out a lot of people, but Cravens explains it quite well and makes a compelling case for seabed disposal, which I barely touched on in my book. posted 27 May 2009 at 6:28 PM by Tom Blees in reply to Alex P.
I would like to see video footage from a remote control submersible as it released each canister. Some ocean trenches that form the crease of subduction zones can get to 700 bar water pressure. Hopefully few canisters would fail. Well, you wouldn’t drop it in those trenches, you’d drop it in deep, stable soft mud. They’ve already figured all of this out, that’s what the Seabed Working Group was all about. I’ll ask Gwyneth if she’d mind me posting that chapter online. If she okays it, I’ll let you know. I’m happy to say that Gwyneth gave me her permission to post her chapter on the Seabed Working Group, which you can find here. It’s a pdf and I noticed it didn’t show up real clear on my browser, but when I downloaded it it was fine. I just scanned it, but it’s plenty readable. Enjoy! I think some progressions need to be done in easy steps the public can follow. I believe Australia should first construct a Gen III reactor once the build time gets under two years. Land based disposal of high level waste should be proven before smaller volume sea bed burial should be entertained. Thus for Australia both Gen III and land disposal should be demonstrated first. Gen IV can then be built next door to a working Gen III plant if the fuel re-use process is straightforward. Most phases of the nuclear cycle except primary enrichment could be probably be done within 300km of Olympic Dam. That includes upgrading the Arcoona waste disposal site near Woomera. Mining, nuclear power, seawater desalination and current waste disposal practices could be done at first. Later on a Gen IV plant and re-processing of Gen III wastes could be added. The Gen III would still get enriched fuel from elsewhere. The area’s disposal facilities for intractable waste should be adequate. What are the benefits and risk of Gen III? Does Gen III have similar passive safety features as IFR? Do Gen III vent radioactive gases to the atmosphere?